A fatal crash in rural Charlotte County early Tuesday morning has completely shut down Bermont Road east of S.R. 31. 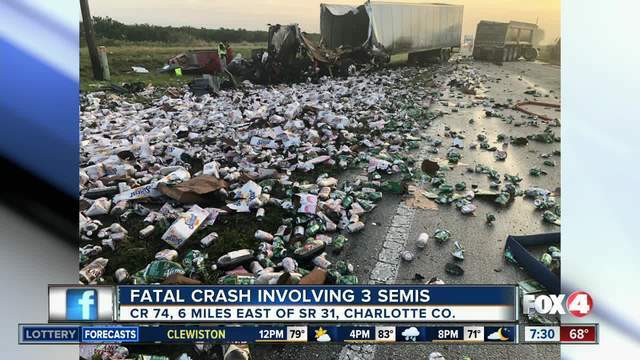 CHARLOTTE COUNTY, Fla. -- A fatal crash in rural Charlotte County early Tuesday morning has completely shut down Bermont Road east of S.R. 31. According to Florida Highway Patrol, the crash happened around 4 a.m. on Bermont Road near Chiquita Drive. Three semi trucks were involved, and a fatality is reported. Soda cans from one of the trucks were scattered all over the scene. Troopers say Bermont Road will be completely closed for an extended period of time. *Note: A previous version of this story indicated a bee truck was involved in this crash. That was a different crash on S.R. 31.